What Product Will Capture Massive Missing-Middle Opportunity? OpticosAn affordable example of Missing Middle Housing that Opticos designed in Richmond, California. Based on local conditions, a family would need to make $45,000 per year to afford one of these homes. Dan Parolek, principal of Berkeley, Calif.–based Opticos Design and creator of www.missingmiddlehousing.com, specializes in desigining sustainable, walkable communities, and defines the missing middle as housing that falls between single-family homes and apartments, and says there hasn’t been much of it built in the past 60 years due to zoning challenges. Yet, despite the glaring need for such housing, creating a profitable business model for building middle neighborhoods is complex. Indeed, a significant roadblock to building middle neighborhoods lies in the constraints developers face in trying to make such product viable, comments John McManus, vice president and editorial director at Hanley Wood, publisher of BUILDER magazine. Doug Farr, president of Farr Associates and author of the new book Sustainable Nation: Urban Design Patterns for the Future, argues nonetheless that missing-middle housing presents a great opportunity for the industry. Scott Choppin, founder of Urban Pacific, is creating his own best practices with rental townhouses in Southern California focused on the multigenerational demographic. The homes feature a bedroom and bathroom on the ground floor, a plan Choppin developed after tracking three trends: housing-supply constraints, the rising rent burden, and the increasing popularity of multigenerational housing. Choppin reviewed every element of the design—from land use to the number of tradespeople required to build it—to create an efficient construction process and minimize costs to make a profitable business model. Farr, too, focuses on reducing the number of trades needed, notably for gas supply and piping and masonry. Urban Pacific’s townhomes sit 25 to an acre and each have five bedrooms and two-car, direct-access garages. Choppin, who calls the product the Urban Town House, or UTH, speaks more about the business model in this short video. Choppin is also leveraging private equity along with tapping into the benefits of the federal government’s Opportunity Zones program. And while he’s impressed with a 25% yield, he’s also providing a much needed social benefit, he feels, providing housing for neglected moderate-income families that will form a sticky tenant base while providing a long-term life for his asset, protecting it from a downturn. As California stares down the barrel of Proposition 10, the UTH properties also provide a very equitable rent option, coming close to falling between market-rate rents and Fair Market Rents. 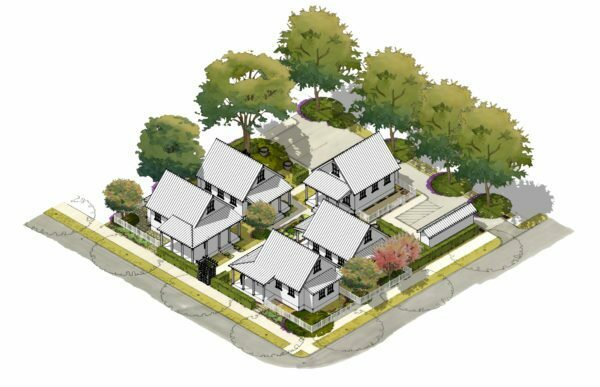 Best practices in the design, construction, and engineering of Choppin’s townhomes provide a powerful example of one way to seize the opportunities available in middle-neighborhood development. As Parolek says, the market is waiting … . Will you respond? This story appears as it was originally published on our sister site, www.multifamilyexecutive.com.